To meet the growing demand for transport solutions driven by the increased traffic flow in the city of Nice, the municipality has decided to extend its tram network. Indeed, since Line 1 carries nearly 100,000 passengers/day on the Henri Sappia-Pasteur line, the service to the urban area needed to be more balanced. This is why two new projects have been launched with innovative ground-based charging technology: the West-East Line project to link the port, the Alpes-Maritimes prefecture and the airport, and the Line 3 project in the Plaine du Var. 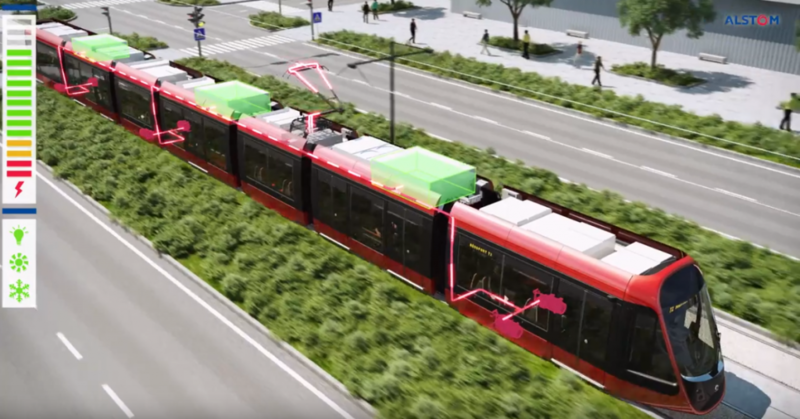 This dual-mode tramway will allow the urban landscape to free itself from unsightly catenaries. Indeed, unlike the existing line, the desire to integrate the tramway into the urban landscape while respecting the city’s architecture has led the municipality to choose a project whose specificity is the absence of a contact air line and a punctual supply at the station. This choice was also motivated by technical reasons: the route of the West-East line meets structures whose height and configuration of the surrounding roads do not allow the installation of catenaries. Therefore, autonomy and energy efficiency being essential criteria, ALSTOM has been developing for 15 years a wide range of catenary-free solutions to power trams. And it is one of its solutions that the Nice Côte d’Azur Metropolis has chosen: an automatic static ground recharge system offering a large energy reserve and a charge of less than 20 seconds. This technology allows trains to recharge at each station during the passenger exchange without additional waiting time. This innovative solution is made possible thanks to the most efficient on-board energy technology with fast charging in the station: lithium-ion capacitor. This technology is characterized by a fast recharge time of 20 seconds, a very large energy reserve (13.5kWh, well beyond the needs in nominal and degraded modes) and a record lifetime (15 years, twice as long as conventional overcapacity technologies). 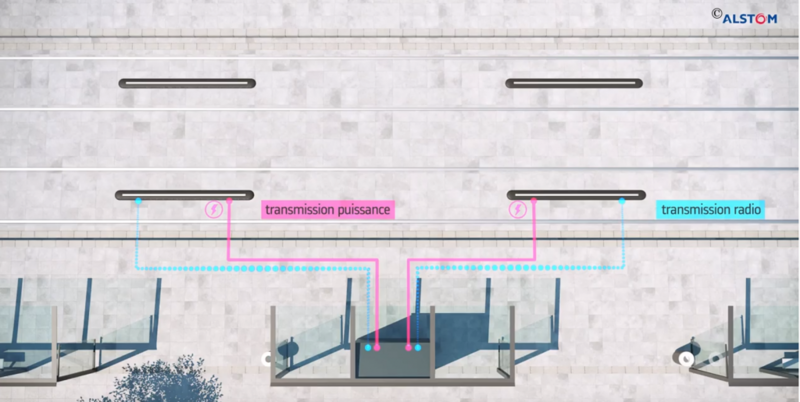 This revolutionary technology is part of a system architecture that does not export any constraints on the design of a conventional tramway electrical network. The equipment installed in the station fits perfectly into the urban furniture and does not require underground technical rooms at the charging points. Batteries are recharged using a ground power supply technology. The vehicle signals its arrival in the charging area by receiving the coded signal permanently emitted by the ground. Detecting this signal and the zero speed of the dual-mode tramway results in the inhibition of traction and the lowering of the charging pads. Then the train emits a coded signal that triggers the closing of the ground contactors and the powering of the charging rail. The transition from charging mode to driving mode is automatically managed without driver intervention. The pick-up pads are raised and the vehicle presence signals are switched off so that the power bars are immediately disconnected. Also, rail heating allows the network to be operated in the event of snow or ice, with the dual-mode tram antenna located directly on the skid. When the tramway operates independently, the traction and climate comfort equipment is powered by batteries (called autonomous boxes). There are then 2 operating modes: the phase where the train is in traction during which the available power allows the equipment to be supplied and the braking phase. When they are not 100% charged, the autonomy boxes first recover the current generated during the braking phases (eco-regeneration mode) while the excess energy is then returned to the rheostats. Upstream, multiple scenarios were analyzed and resolved. Thus, in the event of an untimely stop between two stops, the system ensures passenger comfort for up to 3 minutes without damage and 17 minutes with slight alteration. The restart instruction will then be 20 km/h to the next station with a strategy for relieving the load on the auxiliaries adapted to passenger comfort. Finally, when the tramway reaches the end of the catenary-free zone, the transition from autonomous mode to continuous catenary power supply mode is automatic thanks to a ground beacon and no action by the driver is necessary. In addition, in the event of tunnel operation, the tramway can reach the first underground station independently to make a static transition. The lithium-ion super-capacitor boxes also make it possible to cover a failure of the catenary to reach the next station and evacuate passengers safely. “My role is to operate two batches: SRS (Static Recharge System) and Energy (traction substations). On the Energy part, I work on cable sizing, cable books, connection books and layout diagrams. All electricity distribution must be managed, including high-voltage power supplies that are permanent in tunnels thanks to two cabinets that cut off the artery. To do this, we use two specific tools, AUTOCAD and CANECO. The first one allows to put on plans all the manufacturer’s diagrams, which are used to think the links between the equipment from a wired point of view (between 24 and 72 wires to be wired), to indicate the location of the equipment in a room, such as the transformer, and to specify the location of all the electrical diagrams on the connection book part. The second software is used to calculate the cable cross-section, which complies with the French standard NF C 15-100, which regulates low-voltage electrical installations. It must be verified that the power required by each piece of equipment is supported by the cable cross-section and can therefore be safely released. On the SRS part, my mission focuses mainly on verifying electromagnetic compatibility and ground safety tests. When the tramway is powered by batteries, charging is carried out at passenger stations at 1.50 m high ground level, powered by 750V and up to 1200A. These supply areas become pedestrian areas when the tram leaves the station: it is therefore imperative that the charging power is only released when the equipment is present at the station. Outside this time, the plots are kept unpowered to ensure the safety of people travelling in these areas. Rigour and organisation are essential in this project to ensure that tests are carried out on time, while anticipating possible constraints, such as equipment failure. It is also necessary not to limit oneself solely to knowledge of one’s own field of activity, which is inseparable from a more global knowledge of the operation of the rolling stock itself”. The West-East Line and Line 3 will be delivered at the end of 2019. The number of passengers on these two new lines is estimated at nearly 120,000 per day.